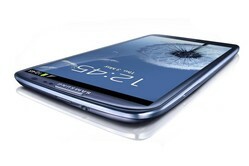 Samsung is introducing an e-warranty service to cut the sale of fake and stolen mobile phones in Ghana. The service allows consumers to check the authenticity of a phone by sending a text message before they make the purchase. Phones without a genuine, unused e-warranty will show up as stolen or counterfeit to help consumers avoid dodgy handsets. "We are particularly worried about the adverse effects these activities have on the public," Frank Atta-Owusu, Samsung service manager, told Global Media Alliance. The ultimate goal is to end "the current era of stolen handset devices," Atta-Owusu said, and restore consumer confidence. Samsung was heavily involved in the switch-off of counterfeit handsets in Kenya - setting up collection points to recycle fakes - and the e-warranty continues the push for change in Africa. The initiatives come as Samsung tries to capitalise on the growth potential of Africa. Last month Samsung outlined plans to double smartphone sales in Africa - which it views as the second biggest mobile market after China - but the prevalence of counterfeits could eat into earnings.